I didn't even know about The Blacklist until a few weeks before it premiered, probably because as of late I haven't watched all that much on NBC and didn't care to keep updated. I let four episodes pile up on the DVR before watching any of it. Castle is on at the same time and time just kept slipping away. But I was hooked after one episode and caught up quickly, and after "The Stewmaker" there was no going back. There is no way that this show will ever let me go, not with its terrific pacing, interesting cases, carefully chosen words and endlessly quotable and memorable lines, attention to detail, lovingly crafted scenes between Red and Liz, the mystery of his attachment to her, and James Spader's funny, charming, cool, enigmatic, and achingly poignant performance. 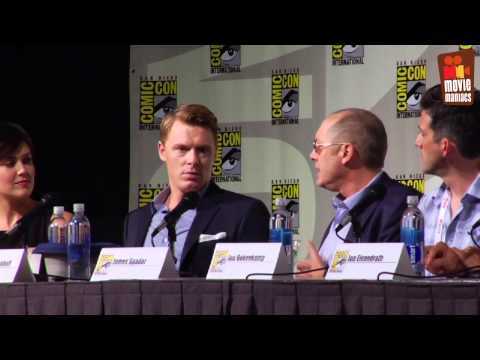 I'm just now devouring interviews and other videos, but if I had known about this show, if I had seen the Comic Con panel, there would have been no question of letting even a day go by before watching the pilot, especially since I had loved Boston Legal so much, thanks in no small part to Spader being brilliant in that, too. What perfect advice for any actor, and what so many fail at. There are very few who you just believe every word and action and expression, who make you feel what they feel. You can tell that they really do feel whatever it is in that moment, because they are drawing on a relatable personal experience, especially when it's deeply rooted. These are innately talented people who just get it. Spader is one of those brilliant performers, because he opens his heart (ripping out ours in the process) instead of keeping everything on the surface. It's actually hard to explain or understand unless you've seen it, but trust me. People like John Noble, Robert Downey, Jr., David Tennant, Matt Smith, Bryan Cranston, and, most recently for me, Clark Gregg have this. When you experience it, you start noticing lackluster performances everywhere else. I would so love to transcribe this man for work. The voice. I melt every time. So Megan and James responded to something in each other's heart? Aww, that's the cutest thing. *blushing* Their chemistry is amazing, so I wouldn't doubt that. The executive producers are all named John/Jon. I knew of Jon Bokenkamp and John Eisendrath, but there's also John Fox and John Davis. HA! Wow. John is very common, but what the...? Oh holy crap, I just checked IMDb and found out John Zinman and John Kelley are co-executive producers. Guess it's easy to remember names around the office. Spader's interrupting answer of "Just watch the show" to the question "Is Liz Red's daughter?" was the best answer possible. People always want to know right now. I was never one to search for my Christmas presents. I loved the anticipation and that translates to my favorite shows. Why would anyone not want to savor all the little clues and fun and beautiful moments that lead up to the reveal of who they really are to each other? It's the big mystery, at least for now.